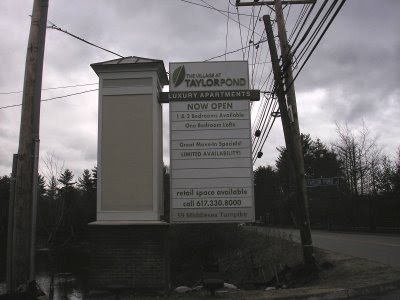 The Village at Taylor Pond, a mixed use development at 59 Middlesex Turnpike has 16,000 square feet of new retail space available. 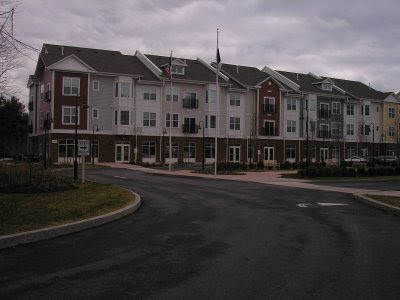 The development is located just south of the intersection of Crosby and Middlesex Turnpike about 1/3 mile north of the Double Tree Hotel. The residential part of the development consists of 6 buildings with 188 apartments and opened last October and is about 50% occupied. The retail space is located on the first floor of two of the opposite facing buildings and consist of 8 units varying in size from 1600 to 2600 square feet. 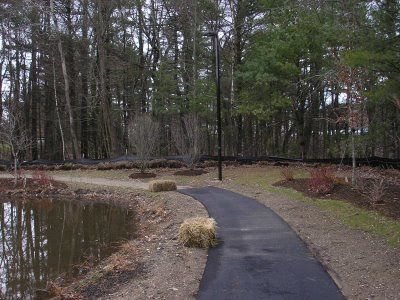 The center of the development includes a public "Greenway" similar to the one designed for Bedford Marketplace. You can click on any image for a more detailed view. 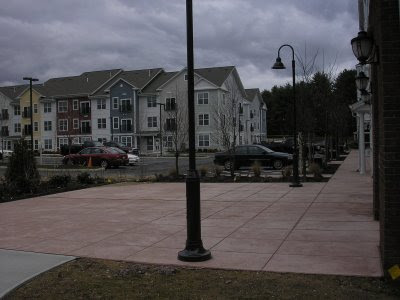 The development was built by Criterion Development Partners, which has built a similar type development in Andover and is currently involved in the much larger mixed use project - Westwood Station. The retail space is located just off Middlesex Turnpike. I recently spoke with Todd Alexander, a Vice President at Colliers, Meredith & Grew which is the company responsible for leasing out the retail space. According to Todd, they are most interested in finding businesses that will be catering to the residents of the development as well as the businesses in the nearby office parks. Todd also mentioned that unlike a lot of other retail space, this is "tenant ready" in that in most cases no additional work is needed for the business to open. In addition, two of the end units were designed with restaurants in mind and feature a cement patio that could be used for outdoor dining. 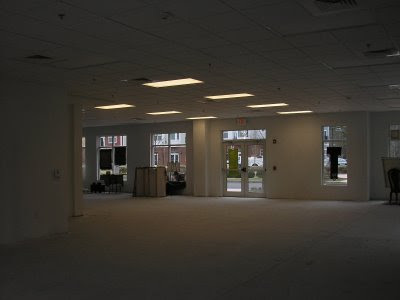 The new spaces feature 10 foot ceilings and is ready for tenants. A patio for outdoor dining is available for a restaurant or coffee shop. As far as what type of businesses, according to the property manager, residents are most interested in seeing a restaurant/coffee shop, a dry cleaner and a convenience store. 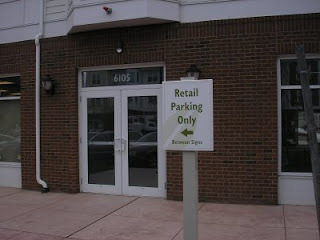 The retail space has reserved parking for 87 or 100 vehicles depending on the time of day. At night, 13 of the spaces become available to residents. 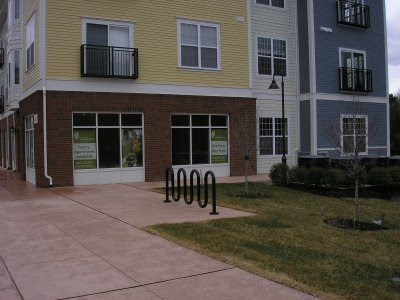 Bike Racks are located at both sides of the development. Along with the 164 apartments at Heritage at Bedford Springs across the street, this adds up to over 350 new apartments with very few stores in the area. 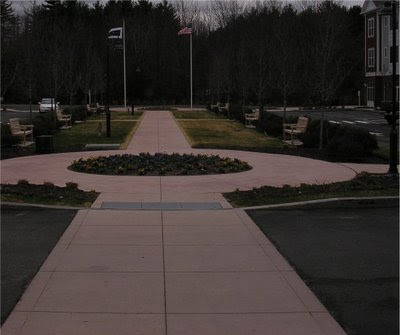 The Goddard School recently opened nearby and the Home Plate restaurant will be relocating from Billerica to 54 Middlesex Turnpike which is only a few blocks away. In addition, work will soon begin on Middlesex Turnpike to make it 2 lanes in each direction and add a much needed sidewalk. Although it may take awhile with the down economy, I think this bodes well for new retail space in this area. I think this area of town will continue to grow. 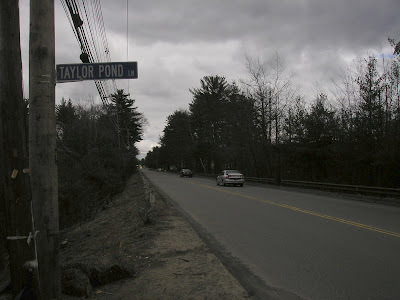 It will be interesting to see if this "new area" (which I would consider Middlesex Turnpike as well as Crosby Drive) gets branded with a new name like East Bedford, a high tech sounding name to represent all the technology companies or something that incorporates the 3 towns (Bedford, Billerica and Burlington) that intersect. A new name might be helpful in attracting new businesses. Middlesex Turnpike will soon be extended to 2 lanes in each direction. 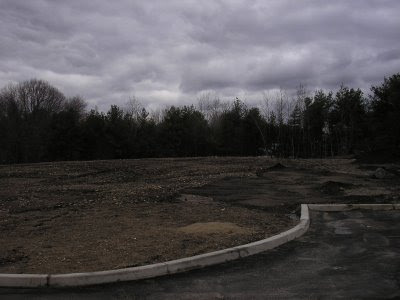 The development features a paved walking trail that will be connected to a sidewalk on Middlesex Turnpike as part of a pedestrian path once the road widening has been completed. In addition to the 6 residential buildings, construction is planned to soon start on a 3 story 5,000 square foot office building with first floor retail space. The new building will have a roadway and sidewalk connected to Plank Street. The Bedford location of UFood Grill closed last week. There are about a dozen location in several states. UFood Grill originally opened in Bedford as KnowFat LifeStyle Grille about 5 years ago. The store underwent a renovation and changed it's name to UFood Grill last July. Since the name change, I noticed the restaurant seemed to be less busy (at least during lunch) and during the past month or two was noticebly quiet the few times I stopped by. Maybe the combination of the economy and the name change did them in. Looking back, with the marketing relationship they have with George Foreman, perhaps a better name would have been The George Foreman Grill. The restaurant is currently vacant with a for lease sign on the window. It looks like they are going to try to sell everything turnkey to another restaurant. This is similar to what happened when Fiji Fujiyama (thanks JMP) closed a bunch of years ago. Most of the equipment was sold to Ginger which opened in the same location. What's interesting is watching which restaurants picks up business when a nearby restaurant goes out of business or renovates and whether they keep the business. When McDonalds closed for renovation in late 2007, one restaurant that seemed to pick up a lot of business was Bedford House of Beef and judging by the lines, they seem to have managed to keep a lot of that business after McDonalds re-opened.